The 8051 microcontroller was designed in the year 1980 by Intel. Intel re-intended 8051 microcontroller was employed CMOS technology and also the latest edition came into existence with a letter C in the name of the title, for design; microcontroller 80C51 rather than NMOS technology. 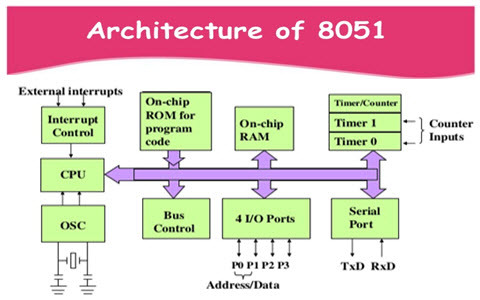 There are two buses in 8051 microcontrollers one for data and other for a program. This microcontroller includes an 8-bit accumulator and the 8-bit processing unit. It also includes 8-bit B register as majorly functioning blocks and microcontroller programming is done with embedded c language using Keil software. For internal working and processing microcontroller comes with inbuilt RAM. This memory is used for storing the temporary data. It is the random memory that is; its data can get be lost when the power supply to the microcontroller turned OFF. There are various applications with this microcontroller. So, 8051 microcontroller projects have great significance in engineering. For any processing unit, CPU is the brain. It examines and manages all processes that are carried out in the microcontroller. The user has no power over the CPU’s functioning. It interprets program printed In storage space and carries out all of them and do the projected duty. CPU manages various kinds of registers in 8051 microcontrollers. It is a subroutine call that requires the key function of the microcontroller.It helps to perform some other program which is extra important at that point in time. The characteristic of 8051 interrupts is extremely constructive as it aids in emergency cases. Interrupts provide us a method to postpone the current process. In common language, it is also known as ROM. The microcontroller also requires a memory to amass data for the short term. The microcontroller includes code memory. It has 4KB ROM and it also includes of RAM of 128 bytes. The bus is a set of wires used to transfer the data. These buses include 8, 16 or more cables. It can bear 8bits, 16 bits altogether. 8051 microcontroller includes 8-bits of the data bus. It is used to cart data. Microcontroller is a digital circuit piece and it requires timer for its operation. The microcontroller is used in the embedded system to manage the device function. For this microcontroller function, it includes 4 I/O ports to unite it to other peripherals. The timers are used for measuring the intervals, to find out pulse width etc. The applications of 8051 microcontroller include large amount of machines, mainly because it is simple to incorporate in a project. The following are some of the applications of 8051 microcontroller. Microcontroller usage is very simple and easy for trouble shoot and also maintaining the system. Most of the microcontroller pins are programmable by the user for performing various functions. It cannot interface directly with high power devices. Do you have any innovative project ideas to execute the microcontroller based projects? Then, feel free to share your ideas for getting your project solutions from us and also other readers, by posting in the comments section below. Here is a question for you, what is the difference between microprocessor and microcontroller? 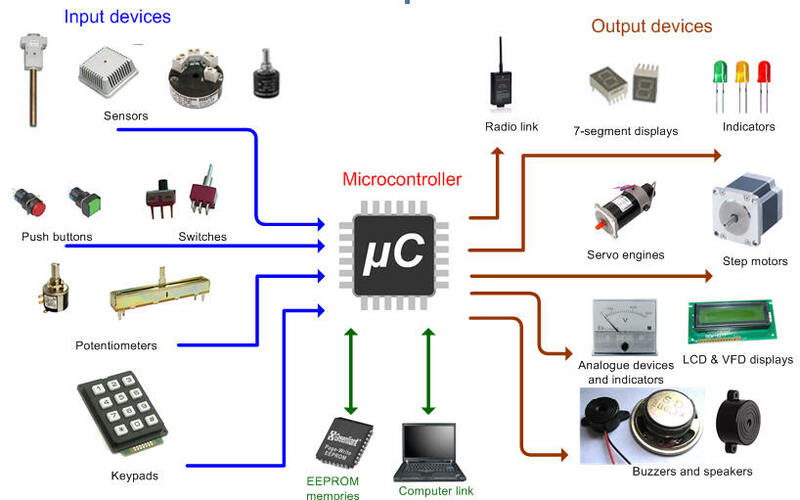 I like your diagrams of the microcontroller architecture and applications. May I use them for a beginner’s workshop for microcontroller programming?